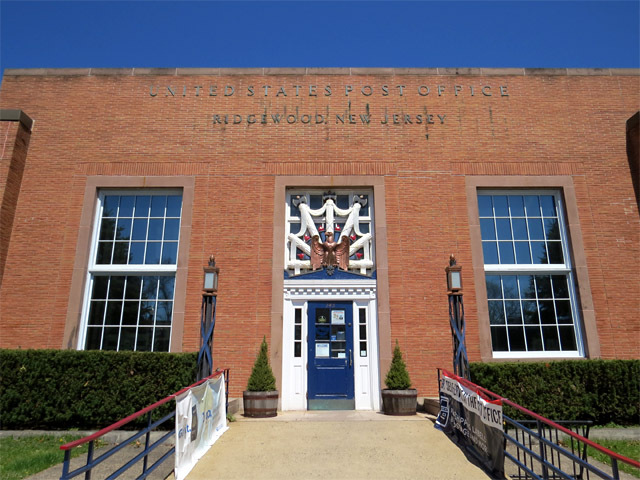 Look closely while passing by the post office in Ridgewood, New Jersey, or you might end up doing a double take. At first glance, particularly from across the street, it appears as though the well-dressed mailman out front needs assistance delivering a letter! 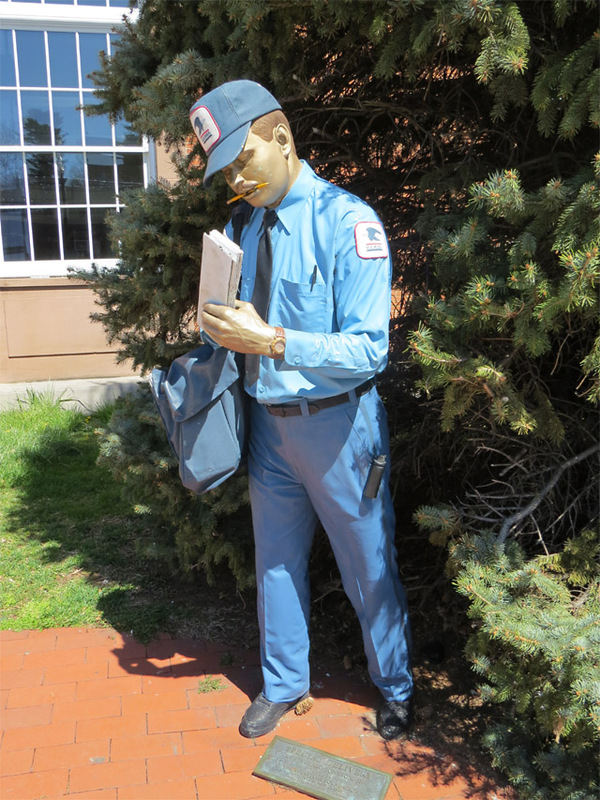 Alas, the sculpture "Special Delivery," [undated], created by J. Seward Johnson, is part of an outdoor sculpture initiative. 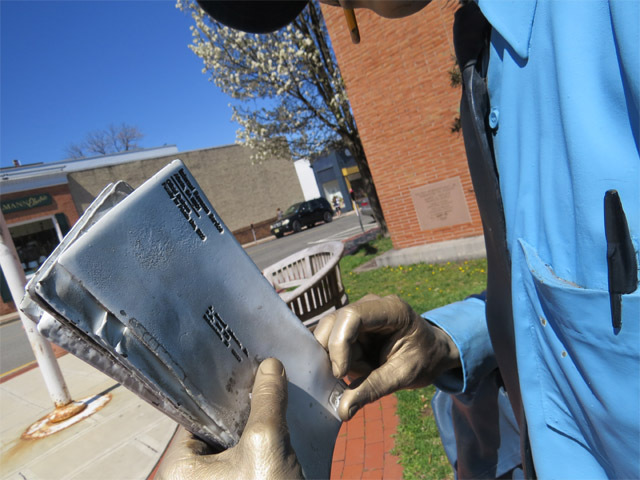 Its placement at the Ridgewood post office, a New Deal construction that itself bears sculptures created with the goal of expanding cultural access in public spaces, is particularly apt. 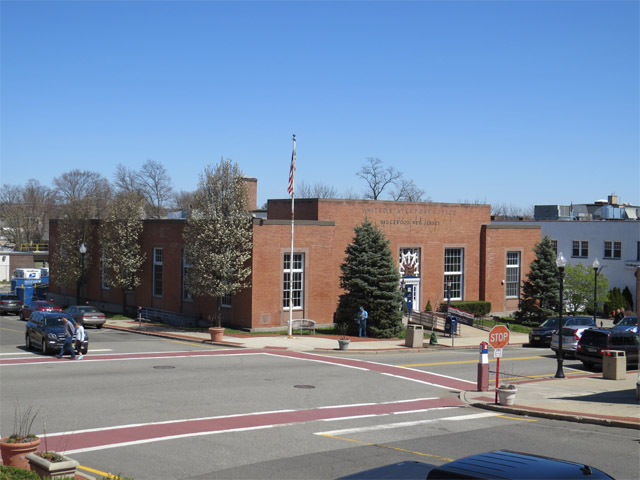 The village of Ridgewood, located approximately 20 miles northwest of Midtown Manhattan in Bergen County, New Jersey, is home to 25,000 people. 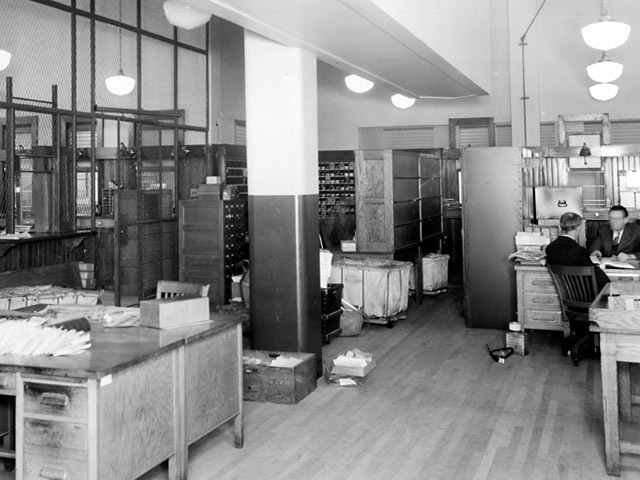 The Ridgewood post office was established in 1865. It received a federal New Deal facility during the Great Depression; construction began in 1937 and was largely completed at the beginning of 1939. 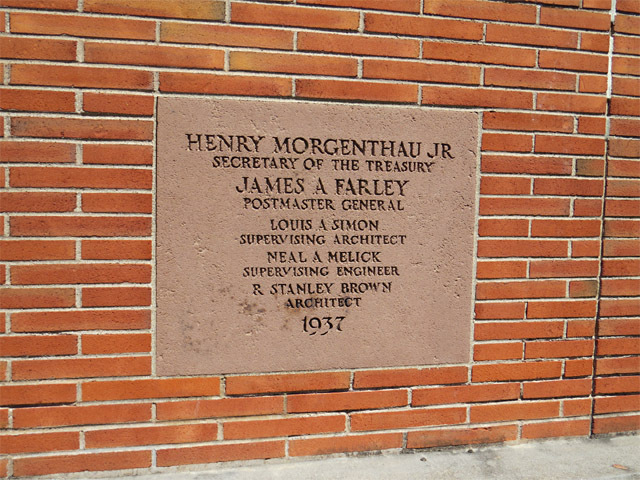 Here, photos of the front entrance to the post office and its cornerstone. 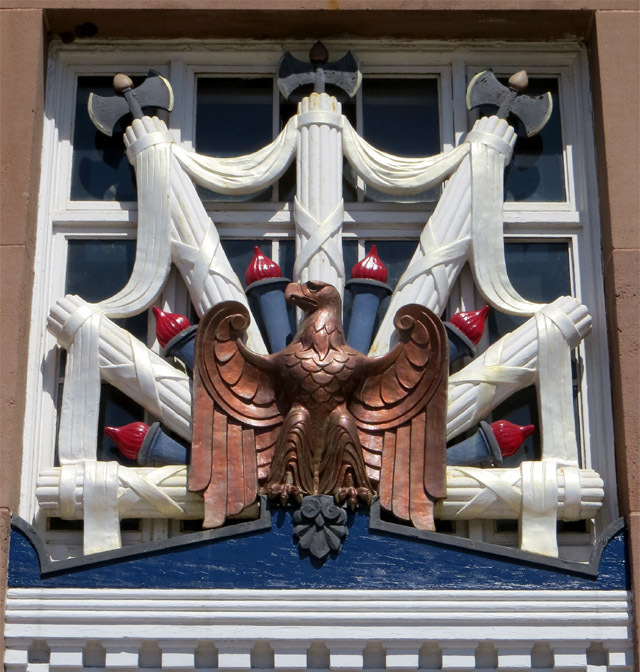 The ornamentation above the entrance to the post office is particularly stunning, and unlike that I've witnessed anywhere else during my travels. It is in apparently great condition and, as early photos you'll soon see show, it is original to the building. A treasure trove of photos of the newly finished facility are available at the National Archives, a few of which are shown below. 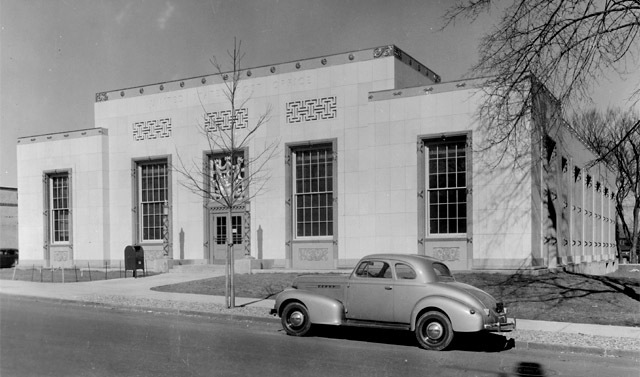 This photo from February 1939 gives you a taste of the Deco ornamentation that encompassed the entire building. You can also see a then-newly-planted tree and numerous additional ornamentation details (above and below the windows, and along the roof line) on the post office exterior that have since been removed. The large tiles have also been replaced with brick. The building just does not bear the same visual presence without them. 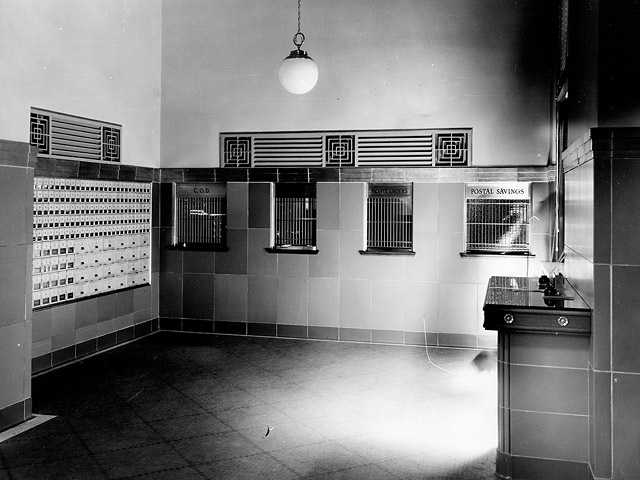 From January 1939: a photo of the post office lobby showing the large tiles, era lamp, and Deco radiator motifs. A second photo shows part of the work area at the same time. One wonders who the two gentlemen at the right are! 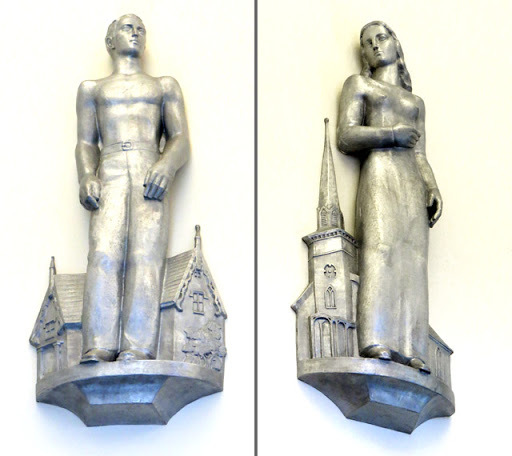 Soon after completion the artist Romuald Kraus was commissioned by the federal Treasury Section of Fine Arts to create a pair of sculptures to be mounted in the post office lobby. Respectively, the untitled work (?) depicts a male and a female figure. The pair of metal reliefs were installed in 1940 and can still be viewed today. 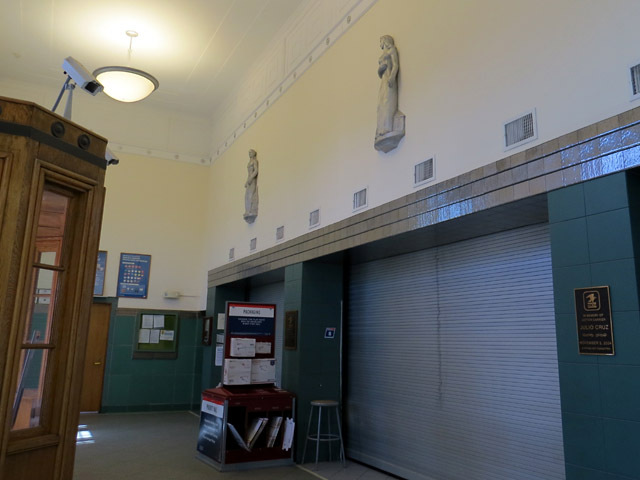 As can be seen from the photo below (showing the sculptures in context), some of the interior magic of the lobby has since been lost, particularly in the replacement of the Deco radiator grilles and light fixtures, as seen above. Much of the tile design appears the same. Facing south, the building is particularly photogenic on a sunny day. During such an afternoon you can snap a beautiful photo, from a high vantage point, of the south and west faces of the building from Van Neste Square Memorial Park. The park is located kitty-corner to the P.O. I took a second look at Special Delivery out front. If you look closely, even the letters the carrier is delivering are parts of the sculpture. I'm not too sure everyone would like to be the recipient of these particular letters, however; if you inspect closely enough you can see that the letter is an official business envelope from the Internal Revenue Service in Atlanta, Georgia! What a special treat to see the sculpture out in front of the building. Any everything else about this building. The sculptures inside and the contract from old to newer. Always a treat to see your work Evan. Keep up the excellent work. I really appreciate seeing you photos and reading your stories.